Protein drinks are a great way to get a meal and energy when you’re short on time. 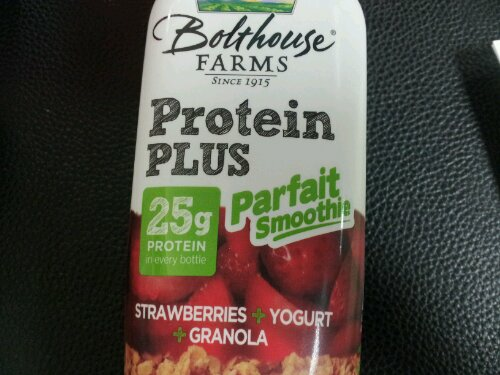 Bolthouse Farms offers a variety of protein smoothies including a very tasty chocolate one, but my favorite has got the be their parfait smoothie. It’s pretty much a blend of strawberries, yogurt and granola. Read on to find out more about this little smoothie packing a punch of protein. The 450 ML bottle contains two servings each at 180 calories. The sodium and carb levelsÂ aren’tÂ too bad, but it does seem to have more grams of sugar (18g) than that of protein (13g). It also packs 3 grams of fiber and 15% of your daily calcium intake. The ingredients include: yogurt, milk, strawberry puree, whey protein concentrate, and it is sweetened with Stevia, cane and brown sugar. Though the main ingredient was water followed by apple juice concentrate. A great perk about this smoothie is it has no preservaticves, artificial flavors, colors, or genetically modified ingredients. Check out the nutrition facts in the picture below. Feeling very hungry mid-afternoon at work, i decided to taste this smoothie and put it to the test.Â I shook up my smoothie so all the ingredients blended together, and sipped away. You get a fresh strawberry taste, and the yogurt and granolaÂ blend so wellÂ to make this parfait drink delicious. This smoothie is a bitÂ thick due to the granola and yogurt, butÂ it isÂ supposed to be a drinkable parfait which makes sense.Â The whole bottle is two servings, which makes this smoothie an excellent meal replacementÂ that actually leaves you fullÂ and satisfied withÂ a great taste. I personally love yougurt parfaits, so this drink is a great creation in my opinion. It left me ready to complete the rest of my work day, get my afternoon workout in and feel full all the way through dinner. Overall, i enjoyed this protein smoothie and would definitely recommend it. It tastes delicious, and definitely keeps you full. Unless you are drinking half of the bottle, I’d recommend you use this smoothie as a meal replacement rather than a snack.Â Aside from the taste, another plus about this smoothie is the fact each bottle gives you 25 grams of protein. Have you tried Bolthouse protein smoothies? What’s your opinion on them and which is your favorite flavor? !